It’s absolutely understandable that Brett Favre has, via texts to his Minnesota Vikings’ teammates, retired from the NFL again. And it will be even better if he changes his mind at some point and returns to play again in 2010. You know why? 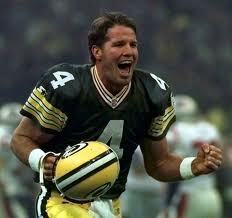 Because it simply proves how much Brett Favre loves professional football. How much he gets from his teammates and the fans and the excitement of competition. And who are we to decide when someone should or should not leave his chosen occupation? That’s right, it’s none of our damned business. For a moment, put yourself in Brett Favre’s shoes. For twenty years, you have been one of the best performers, in the world, at your profession. Then, mostly because you just got too old, you have to quit. Walk away completely. You can’t come into the office even one or two days a week. Cold turkey. Problem is, you are still very good at your job. Your experience offsets the creaking in your bones. Last year, your quarterback rating (107.2) was – get this – second in the NFL to the guy who won the Super Bowl. You threw 33 touchdown passes, and just seven interceptions. And people think they can judge whether or not you need to make a decision about your future? Gimme a break. Brett Favre’s inability to completely cut his ties with the NFL is his business, not ours. 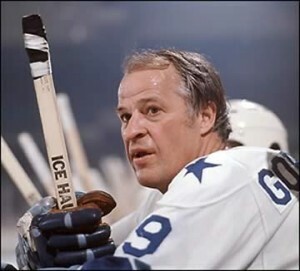 Gordie Howe retired from the NHL, then returned to professional hockey to play with his sons, Mark and Marty, with the Houston Aeros in the World Hockey Association. Michael Jordan retired from the NBA twice. Once to play professional baseball, for gawd sakes! Baseball! Then came back to embarrass himself with the Washington Wizards. Yet, many people still consider Jordan the greatest NBA player ever. I love that Brett Favre is so passionate about the NFL and his team that he just can’t decide what to do. 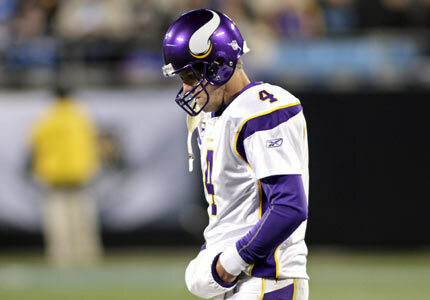 Last year, Favre’s Vikings were one overtime win away from reaching the Super Bowl for the first time since Fran Tarkenton, Chuck Foreman and Ahmad Rashad led the offense – and Alan Page and Carl Eller fronted the “Purple People Eaters” on defence. That was 1976. Brett Favre isn’t required to announce his intentions by a certain time. Or anytime. Brett Favre can do what he wants. The guy has earned it. He’s won a Super Bowl. He’s thrown more touchdown passes than anyone. More than Montana. More than Marino. More than anyone. Brett Favre is one of only five quarterbacks in NFL history to have started 100 games in a row. The others are Peyton Manning, Ron Jaworski, Tom Brady and Joe Ferguson. “If it is (true), then we were lucky enough to watch an unbelievable talent and great guy,” said Dallas Cowboys’ quarterback Tony Romo. “But it’s better to go the year before than a year too late.” Who the hell is Tony Romo? What has he ever won? He can’t even handle a simple snap from centre when it counts. Hey, Tony, how about you shut up! If Favre retires, he retires. If he ultimately decides to play in 2010, he plays. It’s his decision to make, whenever he makes it, not ours. Our job is simply to enjoy watching Brett Favre play for as long as he chooses. Briliant Mr. Big Mouth. As an ardent Vikings fan I agree with you, and as a more general comment about minding your own busines I also agree with you. Great post sir – I laughed out loud at the Romo comment! Glad you enjoyed it…and please accept my condolences about being a Vikings’ fan. It’s hard to let go of something you love. Brett Favre will have trouble letting go of football like Lindsay Lohan has trouble letting go of her crack pipe…like John Goodman has trouble letting go of a big mac, even though it may be the best thing for them.